Linwood Barclay is a Canadian author. I had read another of his books. No Time For Goodbye recently. 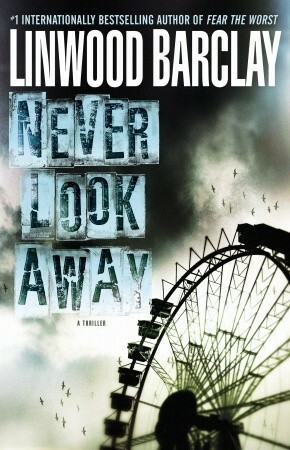 It is reviewed here: https://bookreviewstoday.wordpress.com/2013/03/05/no-time-for-go…inwood-barclay/. I found Never Look Away being promoted in my local library. I could not pass it by! This is a very clever mystery. The author plays word games with the reader. The story in Never Look Away commences on a warm Saturday. David Harwood is glad to be at the recently opened amusement spending quality time with his wife, Jan, and their young son, Ethan. However, what begins as a pleasant family outing turns into a nightmare after an inexplicable disappearance. A frantic search ensues but only leads to a harrowing turn of events. David is just a newspaper reporter in a small town. He is in need of a break because his paper, the Promise Falls Standard, is struggling to survive. He is excited when he gets a lead of a potential scandal involving a controversial development project for the outskirts of this picturesque little upstate New York town, USA. It is a hot local issue. David is sure the story will sell papers and help reverse the Standard’s fortunes, but strangely, the editors will not support its publication. David cannot understand why this is. However, his life is so stressed that the only thing he focuses on is restoring his family. He is desperate to resolve the family’s issues so David dives into his own investigation. He uncovers a web of lies and deceit. For with each piece of evidence he uncovers, David finds himself asking more questions. These take him ever closer to a tragic and shattering truth. This book is really clever and, although the ending is not a surprise, the twists and turns in the tale to get there are many and fascinating. This is certainly a book well worth reading. I highly recommend Never Look Away.